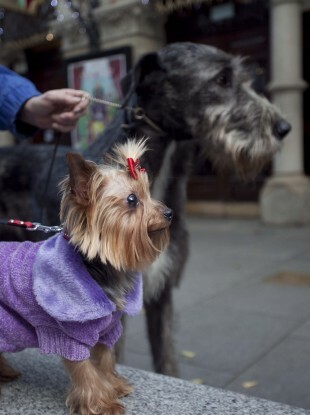 WITH MORE THAN 30,000 dogs in Dublin, that’s a whole lot of… um, waste on the city’s streets. The problem has attracted increased attention in recent years, with more waste baskets in public areas and ads to encourage owners not to let their dogs foul the streets. Now Dublin’s four mayors have launched a new campaign to urge Dubliners to clean up after their dogs and to report any offenders to a special new hotline number. The new freephone number – 1800 251 500 – will let people report the location of any renegade dog fouling, allowing the relevant local authority to take action. Last year there were 400 reports of dog waste on Dublin’s streets and the campaign plans to significantly increase that. Spokesperson for the new campaign Therese Langan said dog fouling is the single biggest environmental gripe that Dubliners have. “Dog owners who do not clean up after their dogs are creating a serious environmental and public health issue for everyone else,” she said. “If not cleaned up and disposed of appropriately, dog faeces can cause serious medical problems such as Toxocara, leading to sight loss in children”. Email “Dublin mayors tell dog-owners: pick up after your pooches”. Feedback on “Dublin mayors tell dog-owners: pick up after your pooches”.